The inspiration for Yvonne's work comes from a wide variety of sources with a particular emphasis on the textured surface. In the natural world it could be the rough patterned bark found on ancient trees, the ripple effect on sand on a windblown beach or the strata in a sea battered cliff face. In the man-made world interest can be found in rusting and corroding metal and weathered and worn stone walls and sculpture. Yvonne's mixed media approach to her textile work reflects her art based background where painterly effects are combined with heat distressed fabrics and stitch. 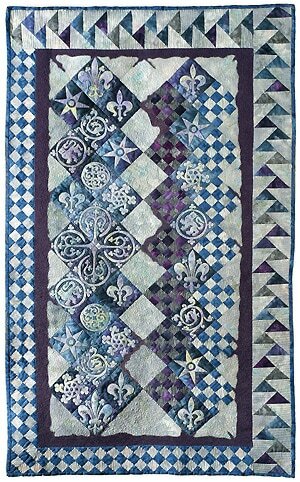 Her book Tex-tiles and Other Treasures demonstrates how she interprets medieval source material into mixed media wall hangings. 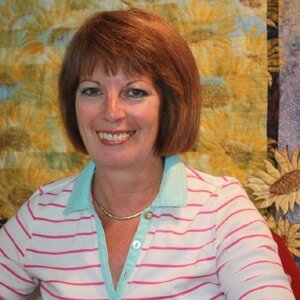 Yvonne creates contemporary wallhangings and embroideries for exhibition and on commission, as well as being an international teacher of creative textiles. Quilted wall-hanging. Hand-dyed and commercial fabrics and Kunin Felt which has been coloured using transfer paints. The blocks are reproduced using Kunin Felt in a reverse appliqué technique. The felt is then cut back with a soldering iron and distressed using a heat-gun. ​Based on the sculpture around the Prior's door at Ely Cathedral. This piece represents the sculpture in good condition in the arched sections, this is machine trapunto, and the central textured panel represents the sculpture in its present worn state.